Ah...January. The first month of a New Year (of sorts; September is too). The Month of Resolutions...or promises...or goal-setting. And if you read my last post, 'wa-a-a-ay earlier this month, you'll know I had my share of New Year's Optimism goin' on. While I'd vowed to "Keep It Simple", I didn't realize how well the "Universe" listened to that vow, and took steps to help me by Slowing Me Down. I've been pretty good at setting aside Wednesdays as 'charity' days, working mainly on charity knitting projects. All the ones I showed in my post have been taken to the church and a narrow scarf that languished at 20 inches is now 34 and growing (the pattern calls for another 17 inches), while a pair of simple mittens is half-finished. 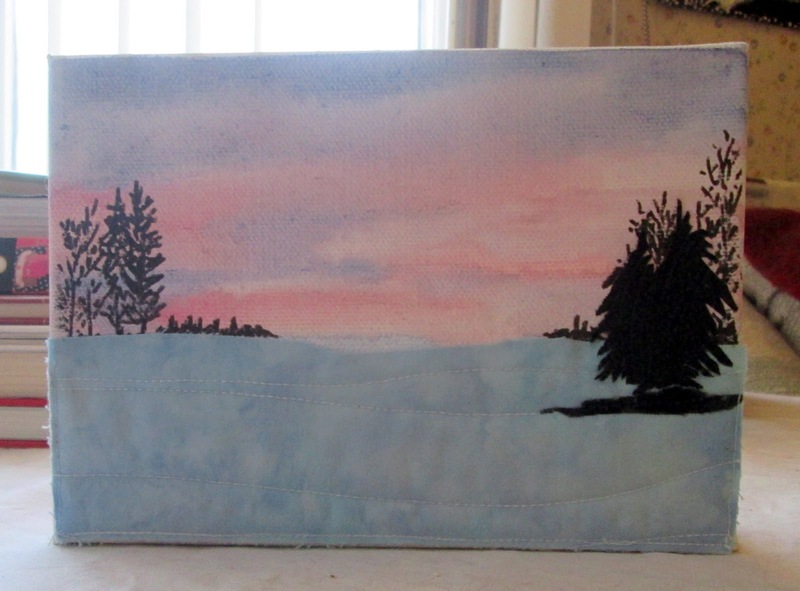 I've been working on art pieces...with second thoughts about having a full booth at Lacombe this year. There's an option called "The Gallery", which will take a few (3, I think) pieces...and I don't have to be there all the time. That's becoming more appealing as I work through "Keep It Simple". 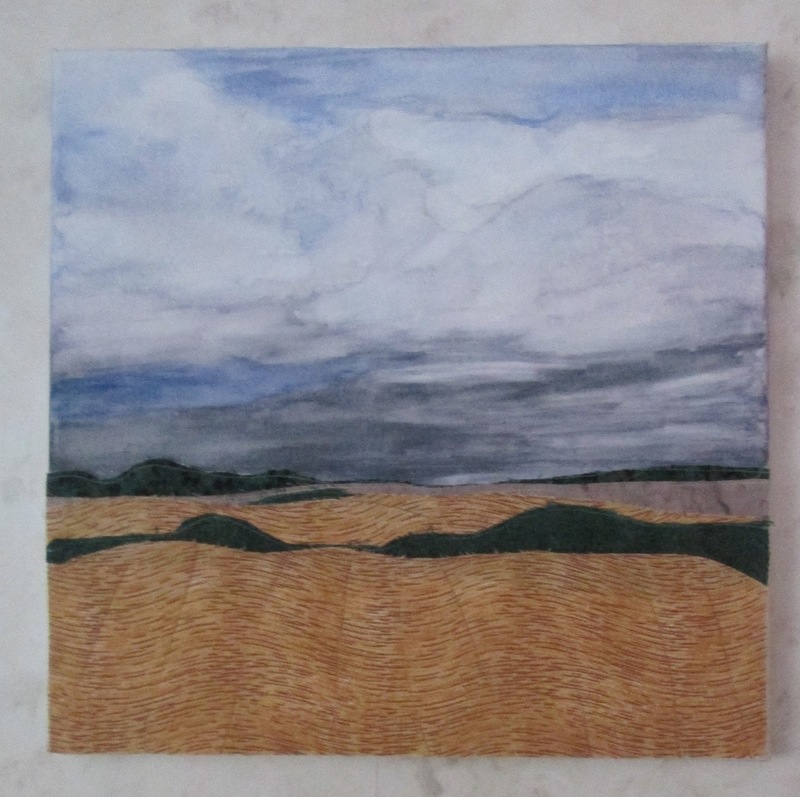 But for now...I showed 2 pieces at the Deep Freeze Festival in Edmonton -- a juried exhibit. I made no sales, but am working with a client to fulfill a commission she would like. It looks like she might go for a mixed media piece on stretched canvas -- a small one, featuring trees. Photos will be on the way to her this week -- snail mail, as she's an older lady and (her words) "I'm illiterate" when it comes to the computer (she doesn't own one). I confess I am particularly thrilled with this last one...and the thrill of it is almost intimidating when it comes to trying another. Do any of you have this happen? You know what I mean? You make something wonderful and have no idea how you'll top it, or duplicate it, or create a similar success with another piece/subject/size/technique. Does this happen to you? I'd love to know I'm not alone! 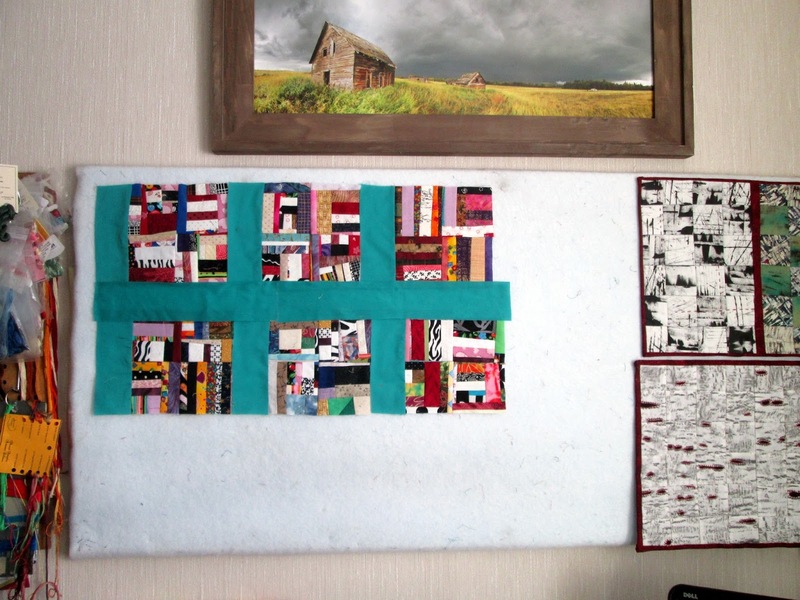 And so...I've spent a lot of time "recovering" (or "refreshing" or whatever one might call it)...by...working on pieced quilts. On the left...6 "crumb blocks" -- each a four-patch of 3 1/2" blocks made of 'crumbs' of fabric. On the right, some of you will recognize "Wall" from last year. Below it is "Scars", with its binding that needs to be hand-stitched down on the back. Yes, another way of slowing me down so that I would Keep It Simple. I still don't know exactly what I'm going to do with those two. They're each 12" x 12" so could go into the SAQA Benefit Auctions for this year and next (you can only enter one piece at a time)...but they're hardly Home Decor here in Bed Quilt Central! So...There you have it. The month is fading fast, and I'm still muddling along, trying to figure out what I should be doing. I have a bed quilt commission that will be started this week (a (4) Rail Fence for my daughter's Air B'n'B) and along with that...more of the same, I think, until the Spirit of Simple says otherwise. Meanwhile, I'll link up to Nina Marie's Off the Wall Friday while I still can, and leave you with Canada's Own Rick Mercer Reports and Rick's take on the Deep Freeze Festival 2018. Enjoy!